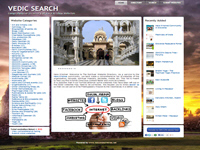 This is The Spiritual Website Directory. Here you can avail a comprehensive list of websites of the organisation, temples, spiritual masters, devotees, media, etc. Category Database, Reference & Encyclopedia July 12, 2012 by ISKCON Desire Tree.